MyMac.Com has reviewed different large multiple-disk storage products recently. They all share some common traits – multiple disks in an enclosure (USB or FireWire), looking like a large single volume, and some form of RAID technology applied. RAID stands for Redundant Array of Inexpensive Disks, and is a server room technology for allowing disks to be pooled. There are different types of RAID implementation, with differing types of data protection and performance. The most common RAID used on two-drive multiple disk products are RAID 0 (disk striping) or RAID 1 (disk mirroring). John Foster of MacBreak Tech refers to these as “Scary RAID” and “Slightly less scary RAID”, which should tell you plenty about how useful these actually are. The fact is that these systems offer at best only slight data protection, and at worse less protection than a single disk USB drive. If something fails, you may lose all of your data, and the unit may need factory repair. You may also need a replacement drive of exactly the same make an size as any others in the unit – problematical if you have had it for more than six months. So, the whole topic is a techy nightmare. What is needed is someone to bring an Apple-like user approach, that is centered on usability, functionality and simplicity. Enter from stage left the Data Robotics Drobo Storage Robot. What you get is a neat, shoe-box-sized USB 2.0 SATA enclosure. Pull the magnetically held front cover off, and four SATA drive bays are revealed. Simply slide a bare SATA drive in, a green light turns on next to it and the unit is ready to go. However, the clever bit happens when you add more drives. Slide another drive in, and the Drobo in the background copies all of the data to both of them. Stick in another, and all three will have copies such that any two drives can provide the data. This means that any drive can fail, and you can pull it out and replace it on the fly, without any downtime at all. Even better, unlike RAID 5, the server equivalent of this, the drives can be of any size or manufacturer – Drobo does not care and will adjust the data usage to give the best protection with still free space. If a drive fails, the light next to it will turn red, indicating that a replacement is required. Drives can be added or removed while the unit is on, and, crucially, data access is unaffected while Drobo is reorganizing it. This seems weird the first time you do it – we are used to handling operating hard drives with care and delicacy, and yet Drobo removes that need. To see what I mean, have a look at the Data Robotics website, where they have a demonstration video clip showing a movie trailer playing on a loop while they pull drives with merry abandon! As the true nature of the data organization on Drobo is hidden from the user, Data Robotics have implemented some straightforward features to allow you to gauge available space. Drobo always looks like one or more 2 terabyte data partitions to the Mac (depending on the size of the disks in the unit), but on the front of the unit there are ten blue LEDs that light to show the percentage of available space consumed by data, which dynamically adjust based on the available disks. The lights flash a warning as you get close to filling the space, so you know to replace one of your drives with a larger one. 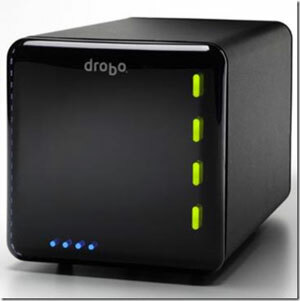 The utility that ships with Drobo allows you to examine the data usage in more detail. In the server world, you always examine a resilient system for any single points of failure, and as I pointed out at the beginning of this review, other products can lead to data loss if parts of the hardware fail. Clearly, the Drobo box itself could fail, but Data Robotics tell me that if that happens, you can pull your drives and reinsert them into another Drobo in the same order, and your data would then be available again. Drobo is a very well thought out system. The fact that it is USB 2.0 only might give one pause for thought, but in fact I feel this is adequate. I have streamed HD video from Drobo without issue, and in truth the data virtualization activities will always limit data throughput from Drobo more than the interface to the computer. The only issue I found with the box during review was that it would occasionally not wake up with my Mac from sleep – but during the review period Data Robotics issued a firmware update that improved this. At $499, Drobo might initially seem expensive, and that price does not include any drives. But you are getting class leading data management that requires virtually no user management or skills. Consider as well that you will never need to buy another drive enclosure, migrate data between drive units or find another USB port for an external drive. Given all of these advantages, I feel that Drobo is a perfect solution for any Mac user who needs to store large amounts of data, and more than justifies the extra cost over a more conventional external drive unit.